Illustration : Xristoforos, « Passengers », 06.05.2010, Flickr (licence Creative Commons). Geography and other social sciences like sociology, anthropology on the one hand, and philosophy and other humanities on the other, engage conceptually and empirically with the spatiality of human societies. 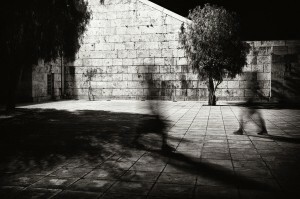 There is now a range of very different theoretical perspectives that are incommensurable, spanning from phenomenology-oriented endeavors — where the relationality of intentionality-driven space is acknowledged in the place of an objective geographical space (see Heidegger 1927, Waldenfels 1983, Ingold 2000), leading to the concept of « eco-symbolic » relationships (Berque 2000) and the reassertion of the concept of place (Bachelard 1957, Casey 1997) — to historical-materialist conceptions, where space is seen as a product of capitalist societies (Lefebvre 1974), as a « third space » (Soja 1996) and a « spatial fix » of financial flows (Harvey 2001). But also linguistic approaches (see Levinson 2003, Levinson/Wilkens 2006) in which language as constituting space and, in turn, as constituted by spatial dimensions, and ethnomethodological approaches, where descriptions of space are conceptualised as enacted through practices (Mondada 2000), have been put forward. We also see sociological approaches where « spacing » as socially produced spatial constitution is theorized (see Löw 2008) and post-colonial approaches, in which Western spatial conceptions are challenged and spaces of the « other » conceptualised (see Bhaba 1994). Despite these theoretical differences, it is interesting to note a theoretical convergence towards the conception of spatial dimensions of practices within several disciplines. An early example of this convergence is the geography of the 1980s (see Thrift 1983, Pred 1986, Werlen 1987), which was probably fuelled by the growing interest in studying practices in different disciplines around Bourdieu’s (1980), Foucault’s (1984a, 1984b) and Certeau’s (1980) practice theories as well as Giddens’s (1984) structuration theory. This growing interest can be related to two so-called “turns” : on the one hand, there is a “practice turn” (Schatzki et al. 2000) where several disciplines put the question of practice in the focus of their investigation, or even consider it a key concept for every single social phenomenon. The spatial dimensions of practice have now gained significance in geographical thought and is advocated by a variety of authors exploring different directions. For instance, Werlen (1997) puts forward the notion of « Alltägliches Geographie-Machen», where the social construction of space is rooted in everyday practices ; Lussault (2000) advocates « spaces of acts », where the placing and different ways of coping with space are developed, especially through norms and competences ; Stock (2004) develops the idea of « practicing places » as dwelling within societies of mobile individuals ; Lippuner (2005) and Thrift (2007) turn to Bourdieu in order to import practice theory into geography, leading the first to insist on habitual spatial practices and the second to the proposition of « non-representational theory », where corporeality and affects become important ; Lussault and Stock (2010) develop the idea of the spatiality of practice as « faire avec l’espace » where different spatial competences in the process of coping with space are fleshed out ; Everts et al. (2011) discuss the ways in which Schatzki’s site ontology can be a fruitful contribution to geographical analysis. On the other hand, a “geographical turn” (Lévy 1999) or “spatial turn” (Soja 1989) puts emphasis on the spatial dimensions of society, which have been neglected in theory-building by social sciences. This acknowledgement allows for the circulation of spatial questions in an interdisciplinary framework and the legitimation of the spatial question in other disciplines than geography. This traversal is meant to contribute to one of the main theoretical problems in social sciences, which is the integration of the spatial dimension in every model or theory where it remains still absent. Doreen Massey’s argument against an “a-spatial approach of the world” (1999, p. 8) is still adequate: “our argument is that working these theories in an explicitly geographical fashion may radically reconfigure fields which previously had been thought without that dimension” (ibid., p. 7). This theoretical convergence on practice and the spatial dimensions makes it important to discuss elements that are relevant for geography, but also for sociology, anthropology, economy and history. The insistence on “spatial practices” can be seen as a major theoretical problem in social sciences for the following reasons. First, it is a serious theoretical alternative to other forms of theory (social systems theory, actor-network theory, civilization theory, institution theory), which is focused on “doing”, and in which the performance and processes of constitution of the “social” via the mobilization of multiple spatial dimensions are at stake. The development of concepts allowing for the integration of the spatial dimensions of practices is therefore a particularly challenging question, as exemplified in the notion of « spatial capital » (Lévy 1994, 2013), sought to expand Bourdieu’s theory of practice through the addition of the spatial dimension of individuals’ dispositions to already conceptualised cultural, economic, social and symbolic capital. Yet, it is still unclear how we can construct a coherent framework; the search for common ground is still underway. Second, and related to the first problem, this theoretical convergence allows for an interdisciplinary conversation on the categorizing of spatial dimensions of society. Several disciplines discover the relevance of the spatiality of practices and discuss the various ways of approaching it. Yet, instead of thinking critically the propositions on spatial practices, construction of space, and exchange across disciplinary boundaries, the discussion revisits again and again the same elements without acknowledging « progress ». By providing a platform for discussion, we hope to trigger a debate on the coherent and pertinent ways of theorizing spatial practices in various scientific disciplines. We would like to open this discussion by taking as a starting point two influential examples from the current broad discourse, i.e. the multiplanar theory of strategic planning developed by Jean Hillier and the practice theory approach elaborated by Ted Schatzki. Jean Hillier is Emeritus Professor of the Chair Sustainability and Urban Planning at RMIT University in Melbourne (Australia). As a geographer, she focuses her research on social justice, ethics and citizen participation in government decision-making and planning theory. In the last years, she has elaborated an approach of strategic navigation for spatial planning. For his part, the philosopher Ted Schatzki is Professor of Philosophy and Geography at the University of Kentucky (U.S.A.). His research interests lie in the theory of social life, theory of action, social ontology, the philosophy of social science, and 20th-century continental philosophy. Over the time, he has developed a practice theory-based approach that explores the way in which sociality is constituted through human activity, social practices and socio-materiality. Both approaches develop ideas about the ways human beings deal with their surroundings, the relationships they entertain with their environment, the ways of organizing and planning the sociomaterial world and the relevance of power. Neither Hillier nor Schatzki can be assigned to an interactionist camp or a structuralist camp. Instead, both aim to work out approaches that try to overcome the distinction between (inter)action and structure. Whereas Schatzki develops his ideas on the basis of a very broad philosophical approach, Hillier’s approach, which is mainly influenced by Deleuze, Guattari and Foucault, is focused on planning practice. However, both authors stand in a tradition of thinking in which geographical, sociological and philosophical concepts and theories are linked and related to each other. This does not only enable them to cross borders of disciplinary thinking but also to elaborate fruitful and surprising insights in the spatial dimensions of human practice(s) in specific historical processes. Bachelard, Gaston. 1957. La Poétique de l’espace. Paris : Presses universitaires de France. Bourdieu, Pierre. 2000. Esquisse d’une théorie de la pratique. Paris : Seuil. Casey, Edward S. 1997. The Fate of Place. A Philosophical History. Los Angeles : University of California Press. Certeau, Michel (de). 1990. L’invention du quotidien. 1. Arts de faire. Paris : Gallimard. Everts Jonathan, Matthias Lahr-Kurten and Matt Wilson. 2011. « Practice matters ! Geographical Inquiry and Theories of Practice » Erdkunde, vol. 65, n° 4 : p. 323-334. Foucault, Michel. 1984a. Histoire de la sexualité. Vol. 2. L’usage des plaisirs. Paris : Gallimard. —. 1984b. Histoire de la sexualité. Vol. 3. Le souci de soi. Paris : Gallimard. Giddens, Anthony. 1984. The Constitution of Society. Outline of the Theory of Structuration. Cambridge : Polity Press. Harvey, David. 2001. Spaces of Capital. Towards a Critical Geography. New York : Routledge. Heidegger, Martin. 1999. Sein und Zeit. Tübingen : Klostermann. Ingold, Tim. 2000. Perceptions of the Environment. Essays in Livelihood, Dwelling and Skill. London : Routledge. Levinson, Stephen. 2003. Space in Language and Cognition : Explorations in Cognitive Diversity. Cambridge : Cambridge University Press. Levinson, Stephen C. and David P. Wilkins. 2006. Grammars of Space. Cambridge : Cambridge University Press. Lévy, Jacques. 1994. L’espace légitime. Paris : Presses de Sciences Po. —. 2013. « Capital spatial » in Lévy, Jacques and Michel Lussault (eds.). Dictionnaire de la géographie et de l’espace des sociétés. Paris : Belin. Lippuner, Roland. 2005. Raum – Systeme – Praktiken. Zum Verhältnis von Alltag, Wissenschaft und Geographie. Stuttgart : Franz Steiner Verlag. Löw, Martina. 2008. « The Constitution of Space. The Structuration of Spaces Through the Simultaneity of Effect and Perception » European Journal of Social Theory, vol. 11, n° 1 : p. 25-49. Lussault, Michel. 2000. « Action(s) ! Une petite théorie de l’action spatiale » in Lévy, Jacques and Michel Lussault (eds.). Logique de l’espace, esprit des lieux. Géographies à Cerisy, p. 11-36. Paris : Belin. Lussault, Michel and Mathis Stock. 2010. « Doing with Space. Towards a Pragmatics of Space » Social Geography, vol. 5, n° 1 : p. 11-19. Massey, Doreen B. 1999. « Issues and Debates » in Massey, Doreen B., John Allen and Philip Sarre (eds.). Human Geography Today, p. 3-21. Cambridge : Polity Press. Mondada, Lorenza. 2001. Décrire la ville. Paris : Anthropos. Pred, Allan. 1986. Place, Practice and Structure. Social and Spatial Transformation in Southern Sweden: 1750-1850. Cambridge : Polity Press. Schatzki, Theodore, Karin Knorr-Cetina and Eike von Savigny (eds.). 2000. The Practice Turn in Contemporary Theory. London : Routledge. Soja, Edward. 1989. Postmodern Human Geographies. The Reassertion of Space in Critical Social Theory. London : Verso. —. 1996. Thirdspace. A Journey into Los Angeles and Other Real-and-Imagined Places. Oxford : Blackwell. Thrift, Nigel. 2007. Non-Representational Theory : Space, Politics, Affect. London : Routledge. Waldenfels, Bernhard. 1983. In den Netzen der Lebenswelt. Frankfurt/M. : Suhrkamp. Werlen, Benno. 1987. Gesellschaft, Handlung und Raum. Stuttgart : Franz Steiner Verlag. —. 1997. Geographien alltäglicher Regionalisierungen. Stuttgart : Franz Steiner Verlag. The four first articles of this Traversal arose in the context of the 2011 edition of the Humboldt Lectures, which were held at Radboud University Nijmegen.